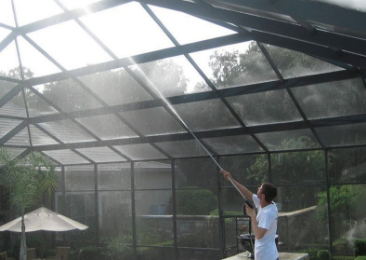 Aside from creating new spaces for our clients, at Fort Lauderdale Screen Enclosures, we also provide service in every needed area to keep your structure looking clean, orderly, and sound. 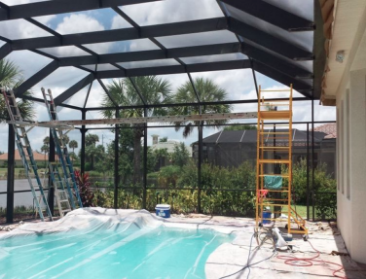 While we do just about everything, you can certainly count on us for pool screen repair in terms of rescreening or complete replacement. It's a practice we have many hours behind over the years, and have designed our work around getting it done with superior quality at efficient speeds and great prices. When the unforeseen happens, or years of usage simply start to add up on your patio or lanai screen, give us a call and it would be our pleasure to restore all of your issues. In addition to monitoring your screen durability and solving all rips or sagging, our business specializes in repairing glass and vinyl sections, pet doors and resistance panels, repainting, visibility windows, and the replacement of fasteners and screws as they lose security. Rusting screws is a very important thing to keep in check as it directly corresponds to your enclosures integrity. Typically how this issue occurs is when the screws top paint coat is worn upon insertion which then gets slowly corroded by the elements over time. Depending on the hardware your previous installer chose this may or may not be a concern, if it is we can certainly help, while if you choose to partner with us for a new project you can be assured we offer only the best stainless steel screws and anchors for this very reason. Some of the other areas to be attentive to include door hardware, like broken or rusted latches, closers, hinges, and kick panels, which can lead to improperly sealed areas thus negating a major point of any screened in porch. Secondly, a screen's outer coating of rubberized material can often be slowly worn away by the sun decreasing its protection and exposing the fiberglass layers underneath resulting in many rips and an overall brittleness. You will know this may be the case if your screen is beginning to appear silvery and shiny in the light. Typically this is something that happens after 10 years or so, and it will be important to make the distinction between overall aging or specific wear. 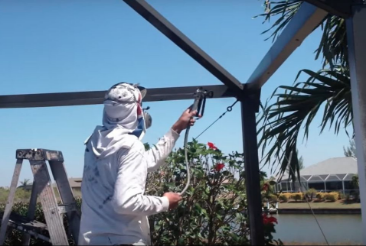 If your entire patio or pool cage has this silky look, than it may be a good idea and much more cost effective route to undergo a total screen replacement as apposed to fixing it piece by piece continually over time. Whereas a partial rescreening may be needed if only one segment has received less shade over the years or has been more exposed than the rest. If you would like to have one of our highly trained eyes come out to your property and take a look to provide a better understanding of what may be the best move, just give us a call and we would be happy to inspect it for you. Over the many years of business we have done a huge variety of repair projects from residential, to commercial, and even in areas of historical restoration. And through this we have not only acquired and learned to work with a great library of advanced tools and skillets, we have also become very effective at blending our repair work to fit right in with existing older components and structures, as well as with any variety of architectural looks and conditions. If you are in need of patio screen repair in a few minor areas or even require a total overhaul, we would love the opportunity to show you the best service in the industry all throughout Ft. Lauderdale and the rest of South Florida, as well as answer any questions.